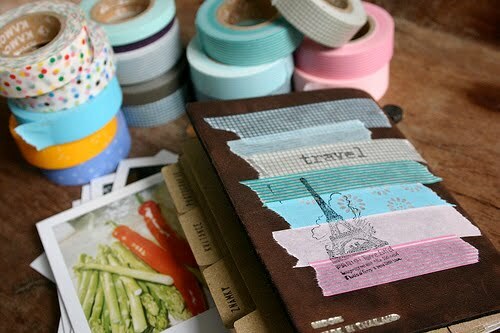 I'm very excited to have these Japanese masking tapes in stock at Papermash. I have been having so much fun already. A glassine envelope wrapped with these tapes. There are so many craft opportunities (if you are into that kind of thing) as it's low-tack, tears easily and can even be written on. I've had wallpaper samples stuck on the wall for over a year with this, and it still doesn't remove the paint when you take it off. Here are some brilliant ideas I've seen - I'd love to hear your suggestions. 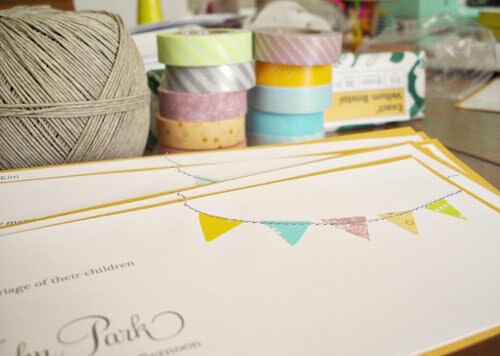 More lovely invitations using the same bunting idea. 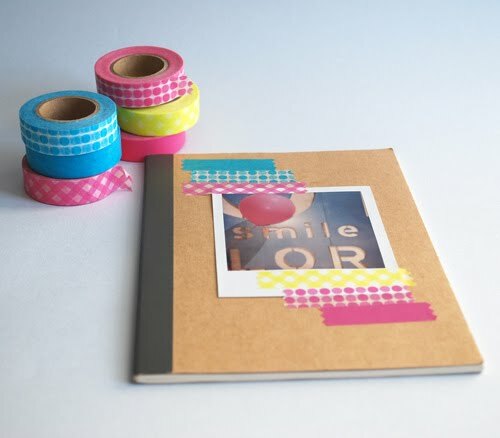 And this is my favourite - using a stamp to customise the tape. Skull and Cross Buns on Folksy has a range of rubber stamps. To celebrate their arrival (there are more coming soon), I'm offering 10% off everything for two days if you use the code teaforjoy (finishing Wednesday.) 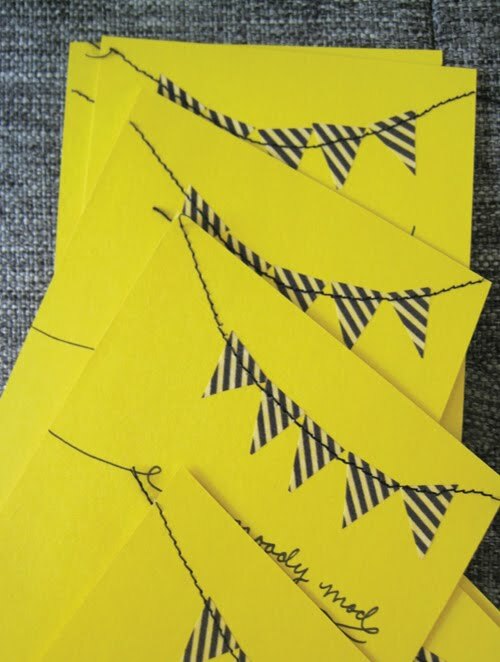 My favourite new items are these striped notebooks (with the text 'Writing, drawing. A notebook makes me feel free and happy' - sometimes Japanese items have quite random English sayings...) P&P is now free in the UK on orders over £25. Thank you! 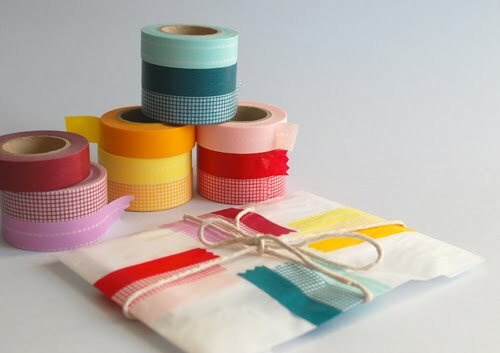 I´ve just bought a nice lace tape! George's mum - it should work, I've had a few orders come through. Try without the ' ' - please let me know if you're still having problems. 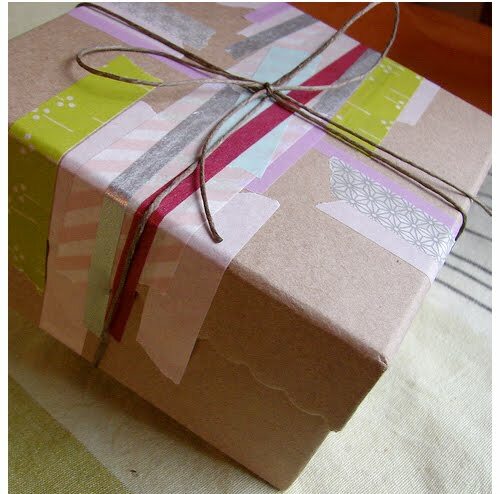 Fantastic tape idea! I love the notebook! These are fabulous! Any idea if/where one can buy in the U.S.??? George's mum - I'll refund you the 10%, don't worry. Not sure why it didn't work for you! I love them! I'm getting some of those. The notebook looks great. I stumbled across your site via the Guardian. I live in Tokyo and am surrounded by the masking tape. A lot of people here tend to use it for umbrellas (to make a signature mark so you can tell yours from others that are the same), in scrapbooks under photos (writing tags with the date, names), and to seal plastic gift bags usually with a cherry blossom sprig tucked in. Your site is great! I can't wait to visit the store when I move. Jillian, I love the umbrella idea! I'm going to look on Flickr to see if I can find photos of any! I loved this post! All the ideas are so great! And I'm so glad these tapes are finally available in the Uk. I'm off to Papermash now to check them out! I want. I need. I love. Seriously, beautiful. LOVE, LOVE, LOVe! Oh I love these and I had a little practise this afternoon with the tape you were kind enough to add to my little give away prize. I am now debating which colours I would like first! Really and truly it makes everything prettier. Nice addition to the shop. i just packed up 12 moving boxes. they would have been so much happier dressed with pretty masking tape. Oh Papermash I love you so. You bring all the lovelies into my life! I live in Japan and I see this tape everywhere. It's so gorgeous. Thanks for sharing your crafts with us! So, so many uses for this tape. Great roundup, and love the last idea with the stamps, brilliant! also, just wanted to say your blog is fantastic, I'm quite new to this and it's great to see such a lovely blog which I could browse through for hours- very inspiring! oh wow! these tapes are fantastic!! oooo! I love this post! Looks fabulous!